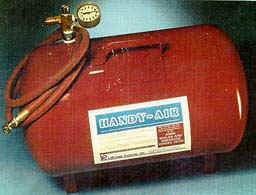 LaGrange Products also produces an off-the-shelf portable compressed air vessel that’s called Handy Air. Its large 9.1 gallon chamber is constructed of .094 heavy gauge carbon steel, can handle 150 PSI maximum working pressure, and complies with OSHA and ASME specifications. Handy Air sports a 6-foot heavy-duty air hose, pressure gauge, pressure relief valve, rigid front and rear 2-leg construction. LaGrange Products’ Handy Air is hydrostatically tested at 225 PSI and comes with a 5-year limited warranty.